There are a lot of great options for recording your Android gameplay videos. Today we'll introduce two popular ways to record your gameplay videos from Andorid devices. 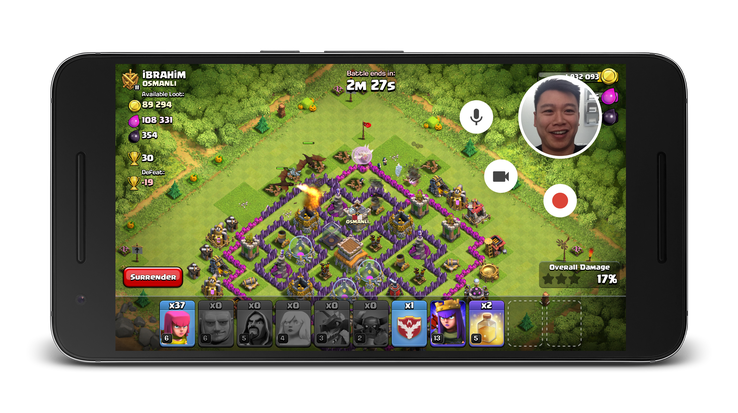 In October of 2015, Google released a feature on its Google Play Games app that allows users to record gameplay and commentary, edit recordings, and upload their creation to YouTube. This feature comes just in time, as Twitch continues to gain popularity, and Google owned YouTube Gaming struggles to compete. While there is currently no support for live streaming, there are plans to add this capability in the future. This feature will be necessary if Google plans to rebrand YouTube as a specialty video service. Google continues to add features to YouTube, but they are struggling to beat out Amazon’s services. Recording is relatively simple with the Google Play Games app. Here’s the video on how to record gameplay on Android with Google Play Games. Step 1: First, install the Google Play Games app from the Google Play store. Step 2: Next, open the Google Play Games App and scroll through your available games. Step 3: Once you have chosen a game, click the round red button to start to record your gameplay. A prompt will appear asking you what quality you would like to record in, and will also inform you how much recording time you have available. Next, a prompt will appear warning you to be careful of typing in personal information while recording, and also to be careful not to capture any copyrighted noises. Click launch, and your game will begin. You will notice that your front facing camera will capture your reaction as you record. You can turn this feature off by clicking the button that looks like a video camera. You can toggle voice capture by using the microphone button. To start recording, click the red circle button and begin playing your game. There will be a countdown and then you can begin recording. To stop recording, simply click the round red button again. You can then find the file in its designated folder and upload it directly to YouTube. Now, connect your Android device to your computer. Hold shift, right click in the Platform Tools folder window, and select “Open Command Prompt.” In the resulting window, type “adb devices” and hit enter. Then type “adb shell screenrecord/sdcard/videoname.mp4”. Where we have written “videoname” feel free to choose any descriptive words you want the filename of your video to be. Hit enter when you are ready to record. When you are done recording, hit CTRL+C. This will end the recording. To view your video, open the file tree of your Android device and navigate to the “SD card” folder. You should see your video in there. This method of recording will ensure a smooth video, with up to 60fps of recording. Unfortunately, this method will only record three minutes at once. Save this file as a command prompt file by putting the .cmd file extension at the end of your file name in the usual save box. This will allow you to record up to nine minutes without having to manually start recording every time. You can add additional lines as you need, and feel free once again to change where we have put “fn” to whatever descriptive filename you would like.